Experience Fashion Focus Chicago, October 17-23! On Wednesday, Glam to Go, a boutique in Chicago’s Roscoe Village neighborhood, presents a free shopping event! Sip cocktails and nosh on nibbles while models will show the Fall collection of one-of-a-kind jewelry from Rock Candy by Helen, matched with select pieces from Glam to Go’s assortment of must-have garments. Take home a goody bag and enter to win giveaways. At Glam to Go (2002 W. Roscoe St), 4-6pm. The Fashion Pops at Block 37′s free shopping event, featuring five pop-up shops including Cityblue and Gray and Frill, offering Fall merchandise for purchase. Don’t miss this unique opportunity to check out looks from a variety of neighborhood boutiques all under one roof! At Block 37 on State St, 10am-5pm. Receive 20% off Custo Barcelona merchandize at Panache boutique in Lincoln Park during Fashion Focus Chicago 2011 when you attend the free Custo Barcelona trunk show! Today through Oct 23. Not free, but fun: Fans of America’s Next Top Model take note: Fashion and beauty inspire at a not-to-be-missed Fashion Focus Chicago event, Mario Tricoci and vitaminwater’s runway show. See looks from five Chicago fashion lines and the exciting conclusion of the 4th annual “Mario, Make Me a Model” contest! Millennium Park, 7:30pm. General $35, students $10. Not free, but fun: Discover the rising fashion design stars of tomorrow at Dress Code, which presents the runway debut of looks by top students at Chicago’s fashion design schools: Columbia College Chicago, Illinois Institute of Art – Chicago, International Academy of Design & Technology Chicago and the School of the Art Institute of Chicago. At the Chicago History Museum, 7:30pm, $25. LGBT, Not free, but fun: Wake Up Call presents looks from a lesbian-geared t-shirt collection designed by Karima Manouzi. The collection was recently endorsed by the cast of The Real L Word. At Minibar Ultra Lounge, 8-11pm. A $10 suggested donation benefits the Luxury Management Living Legend Scholarship Fund. Want the full Fashion Focus schedule in a handy format? Download our free iPhone and Android apps to plan your experience! Refinery 29 celebrates the kick off of Fashion Focus with a video. For a full schedule of Fashion Focus Chicago events, click here. Wednesday’s Dame Myra Hess Concert features pianist Brian Lee, under the world’s largest Tiffany stained glass dome, Chicago Cultural Center, 12:15pm. The National Chamber Choir of Ireland, Ireland’s most distinguished vocal choral ensemble, performs a free concert, Vocal Journeys, tonight at the Chicago Cultural Center, 6:30pm. LAST CHANCE: Not free, but fun: The Joffrey Ballet presents the world premiere of Don Quixote, the classic Cervantes tale, interpreted by Russian choreographer Yuri Possokhov. Possokhov pulls out all the stops: Bullfights, windmills and an unlikely hero in a marriage of Bolshoi ballet and earthy Spanish dance. With live music by the Chicago Sinfonietta. Through October 23, $15-155. 3, 2, 1…Blast off! The Adler Planetarium is free on Wednesday October 19 to Illinois residents. Exploring outer space has never been this easy! The historic Clarke House and Glessner House Museums offer free guided tours this afternoon! Visit these historic mansions in the Prairie Avenue District on the near South Side and get a glimpse of how the rich and famous of 19th century Chicago lived! Both tours are capped at 12 visitors on a first come, first served basis. 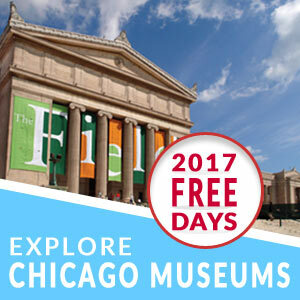 For more information about Chicago’s free museum days, click here. Not free, but fun: From novelist Jonathan Franzen to performance artist Laurie Anderson, rapper Common to musical theater genius Stephen Sondheim, The Chicago Humanities Festival explores the theme tech·knowledgē with the help of a fascinating roster of guests artists. At various locations, October 16 and 23 and November 2-13. LAST CHANCE: Not free, but fun: The Chicago International Film Festivalcontinues! See more than 180 films from 50 countries. Various locations, through October 20th. Check our awesome new Superman (2013) and Transformers 3 movie experience for Foursquare, a free game for your mobile phone. Or choose from five other fun movie experiences: re-create your own Ferris Bueller’s Day Off; follow in the footsteps of The Blues Brothers and much more! Earn the Windy City Foursquare Badge! Eat a frisbee-sized donut and discover a mummy at an always free museum: visit five attractions in diverse Chicago neighborhoods and earn our new Windy City badge for Foursquare! We’ve put together a handy Foursquare list to let you know where to go. Celebrate Halloween with pumpkin patches, haunted houses, spooky movies and more in Chicago’s Parks. Planning a trip to Chicago over the holidays? Here’s an early round-up of December events.